IN DECEMBER 1989 Guido van Rossum, a Dutch computer scientist, set himself a Christmas project. Irked by shortcomings in other programming languages, he wanted to build his own. His principles were simple. First, it should be easy to read. Rather than sprawling over line-endings and being broken up by a tangle of curly braces, each chunk would be surrounded with indented white space. Second, it should let users create their own packages of special-purpose coding modules, which could then be made available to others to form the basis of new programs. Third, he wanted a “short, unique and slightly mysterious” name. He therefore called it after Monty Python, a British comedy group. The package repository became known as the Cheese Shop. Nearly 30 years after his Christmas invention, Mr Van Rossum resembles a technological version of the Monty Python character who accidentally became the Messiah in the film “Life of Brian”. “I certainly didn’t set out to create a language that was intended for mass consumption,” he explains. 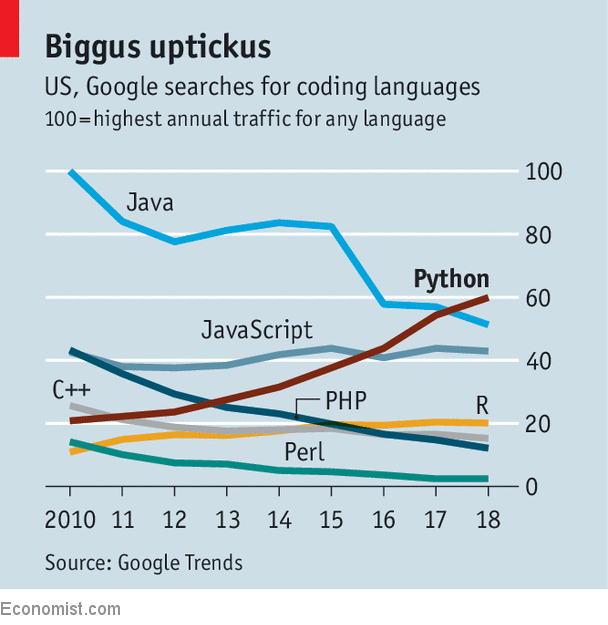 But in the past 12 months Google users in America have searched for Python more often than for Kim Kardashian, a reality-TV star. The rate of queries has trebled since 2010, while inquiries after other programming languages have been flat or declining (see chart). The language’s popularity has grown not merely among professional developers—nearly 40% of whom use it, with a further 25% wishing to do so, according to Stack Overflow, a programming forum—but also with ordinary folk. Codecademy, a website that has taught 45m novices how to use various languages, says that by far the biggest increase in demand is from those wishing to learn Python. It is thus bringing coding to the fingertips of those once baffled by the subject. Pythonistas, as aficionados are known, have helped by adding more than 145,000 packages to the Cheese Shop, covering everything from astronomy to game development. Mr Van Rossum, though delighted by this enthusiasm for his software, has come to find the rigours of supervising it, in his role as “benevolent dictator for life”, unbearable. He fears he has become something of an idol. “I’m uncomfortable with that fame,” he says, sounding uncannily like Brian trying to drive away the crowds of disciples. “Sometimes I feel like everything I say or do is seen as a very powerful force.” On July 12th he resigned, leaving the Pythonistas to manage themselves. Some of the most alluring packages that Pythonistas can find in the Cheese Shop harness artificial intelligence (AI). Users can create neural networks, which mimic the connections in a brain, to pick out patterns in large quantities of data. Mr Van Rossum says that Python has become the language of choice for AI researchers, who have produced numerous packages for it. For professions that have long relied on trawling through spreadsheets, Python is especially valuable. Citigroup, an American bank, has introduced a crash course in Python for its trainee analysts. A jobs website, eFinancialCareers, reports a near-fourfold increase in listings mentioning Python between the first quarters of 2015 and 2018. The thirst for these skills is not without risk. Cesar Brea, a partner at Bain & Company, a consultancy, warns that the scariest thing in his trade is “someone who has learned a tool but doesn’t know what is going on under the hood”. Without proper oversight, a novice playing with AI libraries could reach dodgy conclusions. Bernd Ziegler, a partner at Boston Consulting Group, says that his firm reserves such analysis to members of its data team. One solution to the problem of semi-educated tinkerers is to educate them properly in the language’s arcana. Python was already the most popular introductory language at American universities in 2014, but the teaching of it is generally limited to those studying science, technology, engineering and mathematics. A more radical proposal is to catch ’em young by offering computer science to all, and in primary schools. Hadi Partovi, the boss of Code.org, a charity, notes that 40% of American schools now offer such lessons, up from 10% in 2013. Around two-thirds of 10- to 12-year-olds have an account on Code.org’s website. Perhaps unnerved by a future filled with automated jobs, 90% of American parents want their children to study computer science. No computing language can ever be truly general purpose. Specialisation will necessarily remain important. It is nevertheless true that, in that long-past Yuletide, Mr Van Rossum started something memorable. He isn’t the Messiah, but he was a very clever boy.